2010 was the year when VyprVPN was born to its parent company Golden Frog. The company behind the establishment of one of the best VPN services today has been supplying internet services since 1994 which helped VyprVPN find and acquire a loyal target market in a short span of time. VyprVPN promises big things. VyprVPN’s tagline goes, “Don’t let the internet browse you.” In today’s world with widespread mass surveillance, we can certainly make use of a reliable VPN service that will truly hide us from prying eyes, a VPN company that would not sell us out along the way. The question now is can we even trust VyprVPN? Is VyprVPN a genuine VPN service and not something that’s set up by the government? In this comprehensive review, we will try to answer all these questions. Since VyprVPN is part of the many products of Golden Frog, a company based in Switzerland, it is safe to assume that VyprVPN operate under the jurisdiction of the Swiss government. Golden Frog also complies with the US-EU Safe Harbor Framework, a streamlined process for US companies to comply with EU laws on the protection of consumer data. Golden Frog wants to make it transparent that it is collecting such information only to address technical issues. The information that are not being collected includes user traffic, content of communications and data pockets. The company does not share account details to its affiliates, business partners or any entities that wants to use VyprVPN consumer data for marketing purposes or otherwise. Update: VyprVPN doesn`t keep logfiles anymore, it has been verified by Leviathan Security Group! First of all, VyprVPN is offering a 30 Days Money Back Guarantee to anyone looking to give the service a test run before keeping a VyprVPN subscription. If users are satisfied with the VyprVPN service and overall performance, they can continue to pay for a VyprVPN package. There are 2 VPN plans offered by VyprVPN: Basic and Premium. A VyprVPN Basic plan costs €7.95 per month with unlimited data usage and PPTP support. It allows 3 simultaneous connections. The Premium plan costs €11.95 a month, but it allows 5 simultaneous connections, supports all protocols and comes with the NAT Firewall feature. Both plans get cheaper if customers subscribe for one year. There is also a VyprVPN for Business package that starts at $299.99 per year. This plan is ideal for businesses looking to secure their communication lines. Aside from the free trial access, VyprVPN has also recently introduced a FREE package with a 500 MB monthly data limit. The Free Limited plan also can connect 2 simultaneous devices, NAT Firewall included and supports all security protocols. VyprVPN supports almost all kinds of operating systems and internet-capable devices. VyprVPN will work on most desktops, mobile devices and DD-WRT routers. Aside from the most popular security protocols namely PPTP, L2TP and OpenVPN, VyprVPN has also develop its very own proprietary protocol known as the Chameleon. The Chameleon technology is available in the dedicated client apps for Windows, Mac and Android devices. There is also VyprVPN app available for iOS devices; however, the Chameleon protocol can’t be used due to Apple’s restrictions to only using the IPSec protocol. VyprVPN use varying encryption levels with the supported protocols. 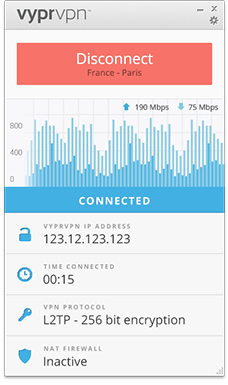 For PPTP, VyprVPN uses 128 bit, 236 bit for L2TP/IPSec, 160-256 bit for OpenVPN and 256bit for the Chameleon protocol. While OpenVPN provide the best features, VyprVPN recommend the use of their Chameleon technology for users that are currently in countries with heavy internet regulations. globe. 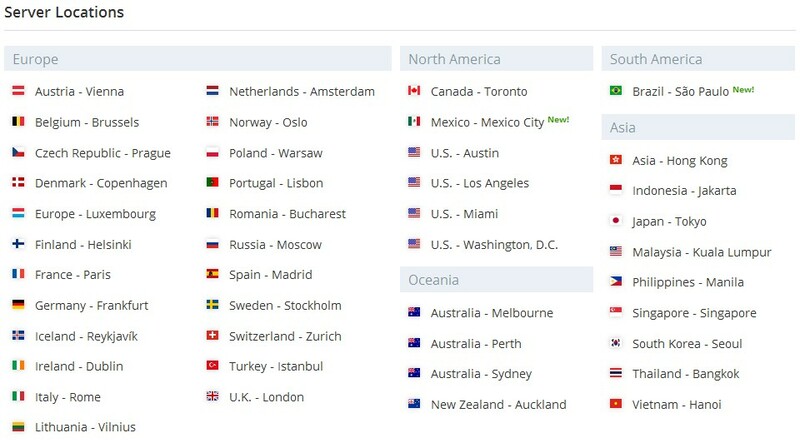 The servers are strategically located in Canada (Toronto), Mexico, US (Austin, Chicago, Los Angeles, Miami, NY, San Francisco, Seattle, Washington), Hong Kong, Indonesia, Japan, Malaysia, Philippines, Singapore, South Korea, Taiwan, Thailand, Vietnam, Austria, Belgium, Czech Republic, Denmark, Luxembourg, Finland, France, Germany, Iceland, Ireland, Italy, Lithuania, Netharlands, Norway, Poland, Portugal, Romania, Russia, Spain, Sweden, Switzerland, Turkey, UK (London), Costa Rica, Panama, Argentina, Brazil, Australia (Melbourne, Perth, Sydney, Auckland) and Colombia. The client is easy to understand. The clear modern design of the software interface guides you through the setting options. You find them right on top of the client when you click on the little settings sign. VyprVPN considers its network as the world’s fastest VPN. Based on the tests we did with VyprVPN, we are certain that it offers one of the most stable and fastest VPN services in the market. The VPN service does not cap traffic or bandwidth as well. VyprVPN’s live chat customer support is among the best. VyprVPN has customer support agents that would quickly respond to your queries with accurate and useful information. VyprVPN is safe from the jurisdiction of the world’s powerful government agencies such as the NSA of the US and GCHQ of UK. Meaning, users will be able to keep their internet browsing habits secure and private while connected to the VyprVPN server. VyprVPN has also added their own DNS solution dubbed as the VyprDNS. VyprVPN’s Smart DNS service is built into VyprVPN which gives VyprVPN users added unblocking features to defeat censorship across the world.